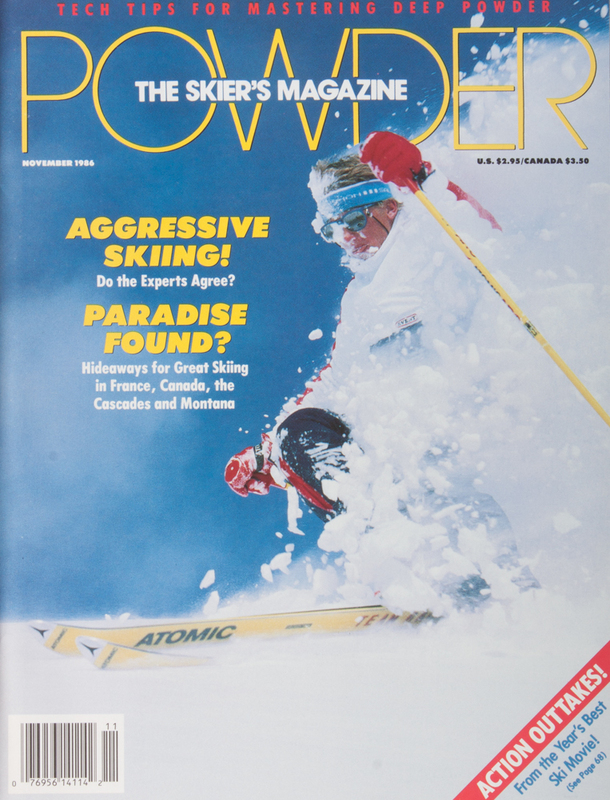 In celebration of POWDER’s 45th Anniversary, we are releasing select stories from every volume. 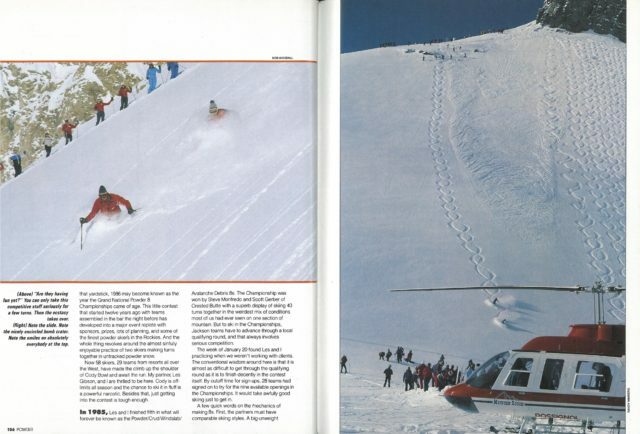 This story originally published in POWDER’s November 1986 issue (Volume 15, Issue 3). About a hundred years ago, an adventurer by the name of William Frederick Cody made quite a reputation for himself by tracking elusive game all over the West. He came to be known as Buffalo Bill and among the cities and monuments named after him is a spectacularly beautiful mountain bowl in the Teton Range of Wyoming. Every winter, in addition to 400-plus inches of snow, Cody Bowl attracts a few dozen moser adventurers seeking tracks of a different sort; perfect pairs of lined turns in powder snow… Powder 8s! 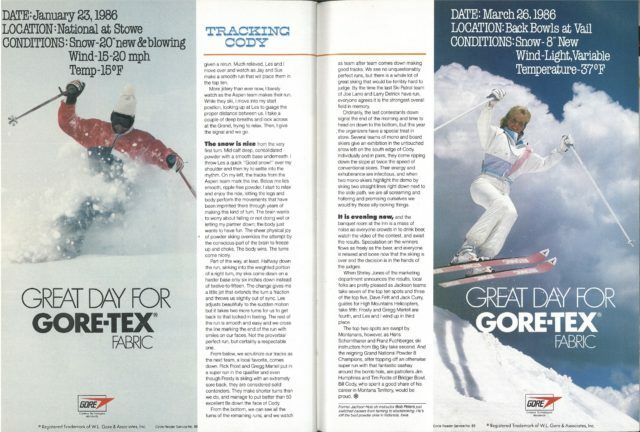 February 8, 1986: I used to get nervous standing at the top of Cody Bowl waiting to make our Powder 8 run. Just knowing from the bottom was sufficient to give me major butterflies. Now, with an ESPN crew filming and media people outnumbering the contestants, my butterflies have metamorphosed into B-52s. It has been said that no field of endeavor becomes truly part of American culture until it has received national television exposure. By that yardstick, 1986 may become known as the year the Grand National Powder 8 Championships came of age. This little contest that started twelve years ago with teams assembled in the bar the night before has developed into a major event replete with sponsors, prizes lots of planning, and some of the finest powder skiers in the Rockies. 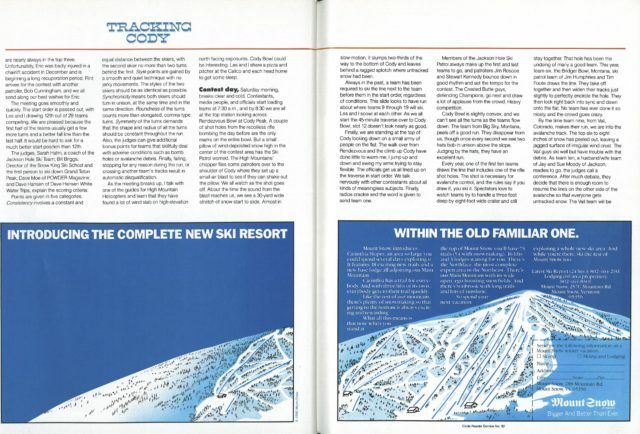 And the whole thing revolves around the almost sinfully enjoyable practice of tow skiers making turns together in untracked powder snow. Now, 58 skiers, 29 teams from resorts all over the West, have made the climb up the shoulder of Cody Bowl and await the run. My partner, Les Gibson, and I are thrilled to be here. Cody is off limits all season and the change to ski it in fluff is a powerful narcotic. Besides that, just getting into the contest is tough enough. In 1985, Les and I finished fifth in what will forever be known as the Powder/Scrub/Windslab/Avalanche Debris 8s. The Championship was won by Steve Monfredo and Scott Gerber of Crested Butte with a superb display of skiing 40 turns together in the weirdest mix of conditions most of us had ever seen on the section of mountain. But to ski in the Championships, Jackson teams have to advance through a local qualifying round, and that always involves serious competition. The week of January 20 found Les and I practice when we weren’t working with client. The conventional wisdom around here is that it is almost as difficult to get through the qualifying round as it is to finish decently in the contest itself. By cutoff time for sign-ups, 28 teams had signed on to try for the nin available openings in the Championships. It would take awfully good skiing just to get in. A few quick words on the mechanics of making 8s. 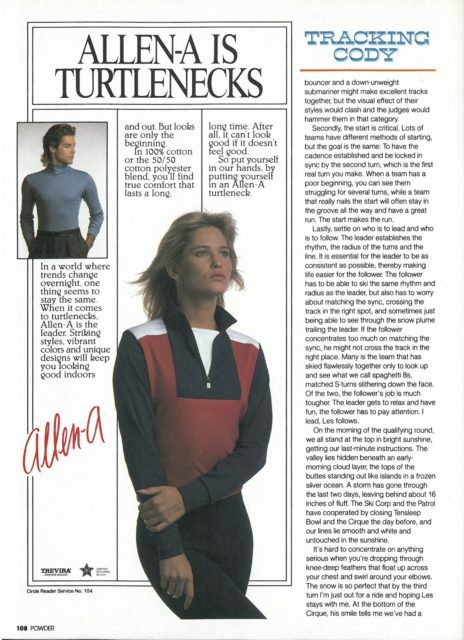 First, the partners must have comparable skiing styles. A big-un-weight bouncer and down-unweight submariner might make excellent tracks together, but the visual effect of their styles would clash and the judges would hammer them in that category. Secondly, the start is critical. Lots of teams have different methods of starting, but the goal is the same: To have the cadence established and be locked in sync by the second turn, which is the first real turn you make. When a team has a poor beginning, you can see them struggling for several turns, while a team that really nails the start will often stay in the groove all the way and have a great run. The start makes the run. Lastly, settle on who is to lead and who is to follow. The leader establishes the rhythm, the radius of the turns and the line. It is essential for the leader to be as consistent as possible, thereby making life easier for the follower. The follower has to be able to ski the same rhythm and radius as the leader but also has to worry about matching the sync, crossing the track in the right spot, and sometimes just being able to see through the snow plume trailing the easer. If the follower concentrates too much on matching the sync, he might not cross the track in the right place. Many is the team that has skied flawlessly together only to look up and see what we call spaghetti 8s, matched S-turns slithering down the face. Of the two, the follower’s job is much tougher. The leader gets to relax and have fun, the follower's job is much tougher. The leader gets to relax and have fun, the follower has to pay attention. I lead, Les follows. On the morning of the qualifying round, we all stand at the top in bright sunshine, getting our last-minute instructions.The valley lies hidden beneath an early morning cloud layer, the tops of the buttes standing out like islands in a frozen silver ocean.A storm has gone through the last days, leaving behind about 16 inches of fluff. The Ski Corp and the Patrol have cooperated by closing Tensleep Bowl and the Cirque the day before, and our lines lie smooth and white and untouched in the sunshine. It's hard to concentrate on anything serious when you’re dropping through knee-deep feathers that float up across your chest and swirl around your elbows. The snow is so perfect that by the third turn I'm just out for a ride and hoping Les stays with me. At the bottom of the Cirque, his smile tells me we've had a good run. The qualifier goes off flawlessly, and everyone gets a fair chance. There are a few excellent runs, a few falls, and a lot of good runs to make things difficult for the judges. We feel good about our run, but after watching lots of great skiers making 8s, we spend the rest of the day sweating out the wait for the judges' decision. At 4:00 p.m. in Bear Claw they finally post the results and we find our names on the qualified teams. Big sigh of relief, lots of congratulations to other teams, and a collective, "See you on Cody Bowl!" The week prior to contest is time for the nerves to star jangling. On Monday afternoon, someone walks off with my powder skis. A hacked-up old pair of K2 712s, they are my go-anywhere guide skis. They and I have made thousands of turns in every imaginable type of snow and I never have to think about which direction they're headed at any given time. I am devastated; I can't believe anyone would want to steal those old beaters. What I fear most is that as soon as the thief takes a good look at them, he'll pitch them in the nearest dumpster. I spend the next 24 hours telling everyone I know to be on the lookout for them. Oh sure, I know you're sitting there thinking, "What a wimp! Ski on something else and quit whining." Well, it's not that I'm superstitious or anything. I just happen to peel my morning banana with my left hand on race and contest days because it’s the most natural thing to do… on race and contest days. I'd do…on race and contest days. I'd do that even if I was superstitious. Which i'm not. Really. Anyway, we spend the middle of the week skiing great out-of-bounds powder with clients while I try to convince myself that I can make consistent powder turns on my racing skis. Then, on Wednesday night, I am I=reprieved by fate when a friend finds my skis in the basement of one of the lodges. I welcome them home like a runaway daughter and spend all day Thursday getting reacquainted. That night is the organizational meeting. We gather in the bar of the Inn before the meeting, familiar faces and new ones, drawn together by a love of powder skiing. Sadly, one very familiar face is missing. Flint Smith and Eric Peltonen, two patrollers from Aspen, were perennial favorites in the contest. They had won two of the last five Championships and are nearly always in the top three. Unfortunately, Eric was badly injured in a chairlift accident in December and is beginning a long recuperation period. Flint arrives for the contest with another patroller, Bob Cunningham, and we all send along our best wishes for Eric. The meeting goes smoothly and quickly. The start order is passed out, with Les and I drawing 12th out of 29 teams competing. We are pleased because the first half of the teams usually get a few more turns and a better fall line than the last half. It would be hard to ask for a much better start position than 12th. Points are given in five categories. Consistency involves a constant and equal distance between the skiers, with the second skier no more than two turns behind the first. Style points are gained by a smooth and quiet technique with no jerky movements. The styles of the tow skiers should be as identical as possible. Synchronicity means both skiers should turn in unison, at the same time and in the same direction. Roundness of the turns counts more than elongated, comma-type turn. Symmetry of the turns demands that the shape and radius of all the turns should be constant throughout the run. Also, the judges can give additional bonus points for teams that skillfully deal with adverse conditions such as bom hols or avalanche debris. Finally, falling, stopping for any reason during the run , or crossing another ream's tracks resulted in automatic disqualification. As meeting breaks up, I talk with one of the guides for High Mountain Helicopters and learn that they have found a lot of win slab on high-elevation north-facing exposures. Cody Bowl could be interesting. Les and I share a pizza and pitcher at the Calico and each head home to get some sleep. Contest day, Saturday morning, breaks clear and cold. Contestants, media people and official star loading trams at 7:30 a.m., and by 8:30 we are all at the top station looking across Rendezvous Bowl at Cody Peak. A couple of shot holes form the recoilless rifle bombing the day before are the only marks on the entire bowl. But a small pillow of wind-deposited snow high in the center of the contest area has the Ski Patrol worries. The high Mountains chopper flies some patrollers over to the shoulder of Cody where they set up a small air blast to see if they can shake out the pillow. We all watch as the shot goes off. About the time the sound from the blast reaches us, we see a 30-yard wide stretch of snow start to slide. Almost in slow-motion, it slumps two-thirds of the way to the bottom of Cody and leaves behind a tagged slouch where untracked snow had been. Always in the past, a team has been required to ski the line next to the team before them in the star order, regardless of conditions. This slide look to have run about where teams 9 through 19 will ski. Les and I scowl at each other. As we all start the 45-minute traverse over to Cody Bowl, slot 12 doesn’t look nearly as good. Finally, we are standing at the top of Cody looking down on a small army of people on the flat. The walk over from Rendezvous and the climb up Cody have done little to warm we; I jump up and down and wing my arms trying to say flexible. The officials get us all line up on the traverse in start order. We talk nervously with other contestants about all kinds of meaningless subjects. Finally radios crackle and the word is given to send team one. Members of the Jackson Hole Ski Patrol always make up the first and last team to go, and patrollers Jim Roscoe and Stewart Kennedy bounce down in good rhythm and set the tempo for the contest. The Crested Butte guys, defending Champions, go next and draw a lot of applause from the crowd. Heavy competition. Cody Bowl is slightly convex, and we can’t see all the turns as the team’s flow down. The team from Big Sky, Montana., peels off a good run. They disappear from us, though once every second we see two hast bob in unison above the slope. Judging by the hats, they have an excellent run. Every year, one of the first ten teams draws the line that includes one of the rifle shot holes. The shot is necessary for avalanche control and the rules say if you draw it, you ski it. Spectators love to watch teams try to handle a three-foot deep by eight-foot wide crater and still stay together. That hole has been the undoing of many a good team. This year teams six, the Bridger Bowl, Montana, ski patrol team of JIm Humphries and Tim Foote draws the line. They take off together and then widen their tracks just slightly to perfectly encircle the hole. They then lock right back into sync and down onto the flat. No team has ever done it so nicely, and the crowd goes crazy. By the time team nine, from Vail, Colorado, makes their run, we are into the avalanche track. The top six-to eight inches of snow has peeled out, leaving a jagged surface of irregular wind crust. The Vail guys ski well but have trouble with the debris. As team ten, a husband/wife team of Jay and Sue Moody of Jackson readies to go, the judges call a conference. After much debate, they decide that there is enough room to resume the lines on the other side of the avalanche so that everyone gets untracked snow. The Vail team will be given a rerun. Much relieved, Les and I move over and watch as Jay and Sue make a smooth run that will place them in the top ten. More jittery than ever now, I barely watch as the Aspen team makes their run. While they ski, I move into my start position, looking up at Les to gauge the proper distance between us. I take a couple of deep breaths and look across at the Grand, trying to relax. Then, I give the signal and we go. The snow is nice from the very first turn. Mid-calf depp, consolidated powder with a smooth base underneath. I throw Les a quick "Good snow!" over my shoulder and then try to settle into the rhythm. On my left, the tracks from the Aspen team marked the line. Below me lies smooth, ripple-free powder. I start to relax and enjoy the ride, letting the legs and body perform the movements that have been imprinted there though years of making this kind of turn. The brain wants to worry about falling or not doing well or letting my partner down; the body just want to have fun. The sheer physical joy of powder skiing override the attempt by the conscious part of the brain to freeze up and choke. The body went. The turns come nicely. Part of the way, at least. Halfway down the run, sinking into the weighted portion of a right turn, my skis come down on a harder base only six inches down instead of twelve-to-fifteen. The change gives me a little jet that extends the turn a fraction and throws us slightly out of sync. Les adjusts beautifully to the sudden motion but it takes two more turns for us to get back to that locked-in-feeling. The rest of the run is smooth and easy and we cross the line marking the end of the run with smiles on our faces. Not the proverbial perfect run, but certainly a respectable one. From below, we scrutinize our tracks as the next team, a local favorite, comes down. Rick Frost and Gregg Martell put in a super run in the qualifier and even though Frost is skiing with an extremely sore back, they are considered solid contenders. They make shorter turns than we do, and manage to put better than 50 excellent 8s down the face of Cody. From the bottom, we can see all the turns of the remaining runs, and we watch as team after team comes down making good tracks. We see no unquestionably perfect runs, but there is a whole lot of great skiing that would be terribly hard to judge. By the time the last Ski Patrol team of Joe Larro and Larry Deitrick have run, everyone agrees it is the strongest overall field in memory. Ordinarily, the last contestants down signal the end of the morning and time to head down on down on the bottom, but this year the organizers have a special treat in store left on the south edge of Cody. Individually and in pairs, they come ripping down the slope at twice the speed of conventional skiers. Their energy and exuberance are infectious, and when two mono-skiers highlight the demo by skiing tow straight lines right down next to the slide path, we are all screaming and hollering and promising ourselves we would try those silly-looking things. It is evening now, and the banquet room at the Inn is a mass of noise as everyone crowds into drink beer, watch the video on the contest , and await the results. Speculation on the winners flows as freely as the beer, and everyone is relaxed and loose now that the skiing is over and the decision is in the hands of the judges. When Shirley Jones of the marketing department announces the results, local folks are pretty pleased as Jackson teams take seven of the top ten spots and three of the top five. Dave Fett and Jack Curry guides for High Mountains Helicopters take fifth, Frosty and Gregg Martell are fourth, and Les and I wind up in third place. The top spots are swept by Montanans, however, as Hans Schernthaner and Franz Fuchsberger, ski instructors from Big Sky take second. And the reigning Grand National Powder 8 Championship, after topping off an otherwise super run with that fantastic sashay around the bomb hole, are patrollers Jim Humphries and Tim Foote of Bridger Bowl. Bill Cody, who spent a good share of his career in Montana Territory, would be proud.